Bill Mollison, known by many as Australia’s ‘father of Permaculture’, was famously quoted as saying that ‘though the problems of the world are increasingly complex, the solutions remain embarrassingly simple.’ While I’ve always loved this quote, I don’t think I quite grasped it’s true meaning until our recent visit to Millpost Merino in the Southern Tablelands of New South Wales. David and Judith were early adopters of Permaculture principles and methods, 'rebels with a cause'. After taking over the property the couple worked tirelessly to regenerate what was once a cleared and windswept farm. They have spent decades planting trees as windbreaks, woodlots, and as protection from the heat, as well as regenerating native vegetation to form wildlife corridors and provide shelter for their sheep. The result is nothing short of remarkable. Instead of cleared plains of grass and exposed earth, visitors to Millpost find a veritable oasis, with an abundance of trees, native and perennial grasses, and thriving flora and fauna. David wasn’t always a Permaculture trailblazer. He spent his early adult years studying a Law Degree at the Australian National University (ANU). ‘All of this land was in my family but I wasn’t planning a farming career. My father had always told me there’s no money in farming, and I didn’t want to do it if I was just going to be exploiting and degrading the land, so I’d gone in another direction. It was Permaculture that brought me back to the farm,’ says David. The term Permaculture comes from ‘permanent agriculture’, and the concept is about creating productive systems that harmoniously integrate the land, animals and people, providing a positive solution to environmental exploitation. ‘I gave the law career the big flick once I learned about Permaculture,’ smiles David. The property includes several houses, shearing and work sheds, an old dairy and the family’s home, an outstation from the original property which was once much larger. Approaching the main home through vegetable gardens, a smattering of fruit trees, low hanging branches and rambling roses, we enter into a dining room that immediately feels warm and embracing. To our left, the kitchen, with it’s sloping ceilings and wide timber floorboards, remains almost untouched by time. Over a feast of home-grown salad greens, eggs, sourdough bread, pickles and preserves, the conversation continues to revert back to how Permaculture constantly guides the family and the operation of the farm. ‘We use water harvesting to capture water high up and gravity feed it to where we need it, so there’s no energy required to pump water. That’s what Permaculture is about, designing systems that save energy and reduce fossil fuel use just through thinking and using common sense. Sadly there’s not much common sense used anymore, convenience and consumption seem to have taken over,’ says David. Eldest son Harry, 33, says his parents showed by example that you can have a fulfilling life on the land that’s not always a battle against the elements and ever fluctuating market prices. ‘I have that same attitude towards agriculture - it doesn’t have to be destructive and you can work with nature rather than against it,’ he says. ‘The argument that consumers should have to pay more for food that doesn’t cost the earth or that’s been grown biodynamically, or whatever, is not necessarily true,’ says Harry. Harry studied a Bachelor of Science (Forestry) through the ANU in Canberra and now focuses on the holistic management of the property. ‘I’m not a gardener - my brothers Roy and Murray got the gardening gene from my parents but I missed out somehow. I’m more interested in the landscape,’ he says. ‘I’ve found that holistic management, and the decision making and planning processes that go with that, are a really good way of dealing with all these things. I’ve completed training with the Savory Institute and it’s really helped me to understand meaningful things like long recovery periods and bunching animals to drive change in ecosystems that are brittle,’ says Harry. 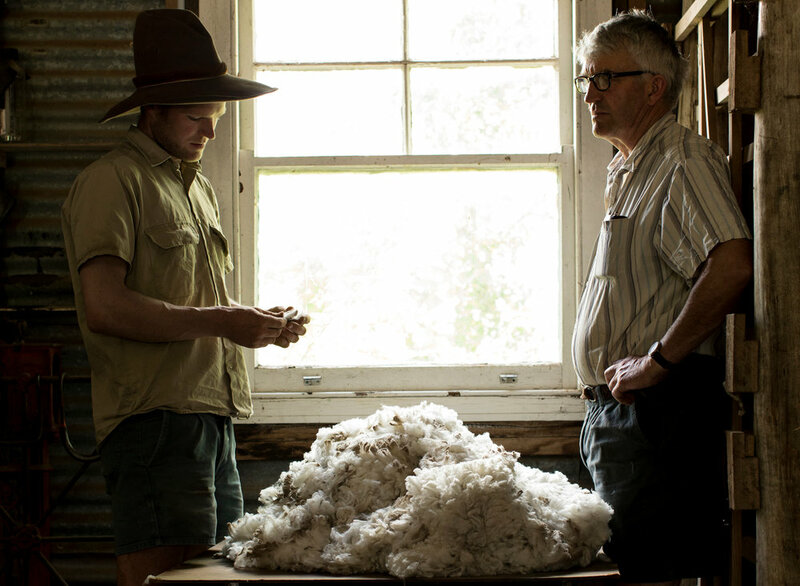 While the majority of wool produced at Millpost is sent to Sydney in its raw form where it’s sold to the highest bidder, the family recently started producing small batches of superfine knitting yarn. The yarn is grown, spun and dyed here in Australia and New Zealand and is sold directly to the public and through a small selection of retailers in Sydney and Melbourne. While communicating directly with the end user is a new and challenging experience for them, Harry says that it’s been a valuable one. ‘We know the quality of our wool is very good, but at the moment there’s such huge demand for superfine wool that it would still sell pretty well regardless. If that wool is just disappearing to Italy and China and we never see what happens to it, then there’s very little incentive to improve. Having direct contact with the people that are using our wool means we get to hear their feedback which is really motivating,’ says Harry. While only a small fraction of Millpost wool is currently turned into yarn, the family is hoping to extend this to include production of fine garments in the future. The yarn is also the result of the family grappling with the issue of succession planning. ‘Along with Mum and Dad, I’ve got two brothers, and we’ve all got an interest in the farm. We’re only 1,100 hectares, which for running sheep is not enough to support what is potentially four families. So we’ve got to be creative and work out how we can ‘stack’ different businesses and value add,’ says Harry. Until then, the Watson family will continue to do what they do best - working the land in harmony with nature, using innovative and practical solutions to their farming challenges, and building a lifestyle of abundance on their small piece of paradise.